This gorgeous pink skirt from independent clothing brand Candy Rain is full of delicate details, and is perfect for a range of girly fashion styles. The skirt is constructed from three layers of different fabrics, a see-through overlay with embroidered musical notes, a clear organza middle layer to give the skirt shape and a pink layer to complete the look. The skirt features a stretchy shirring panel at the back and in built safety shorts. 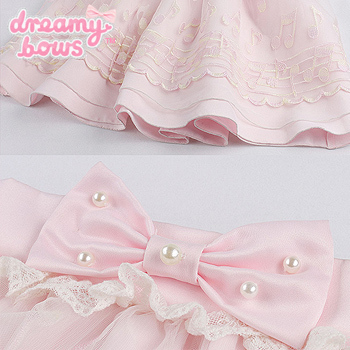 The bow on the waistband is adorned with pearls and the beautiful embroidery features musical notes in pastel pink and cream gradients giving the skirt an adorable whimsical feel.